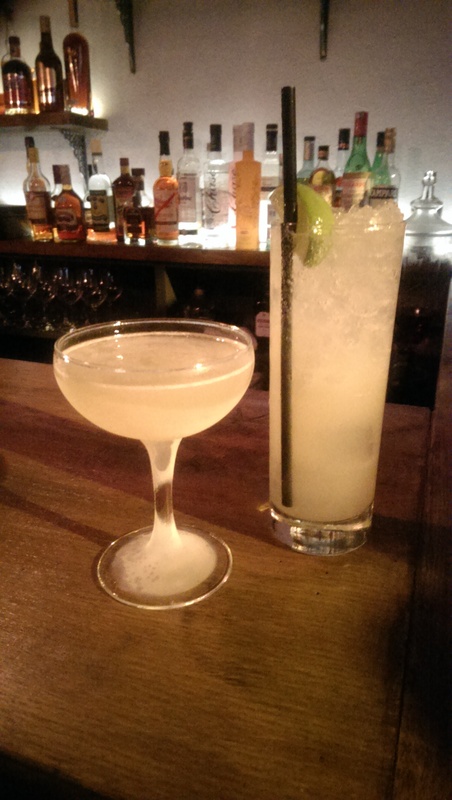 See our previous review of PortSide Parlour at Broadway Market for more info on drinks! Though we will cover some new ones here. 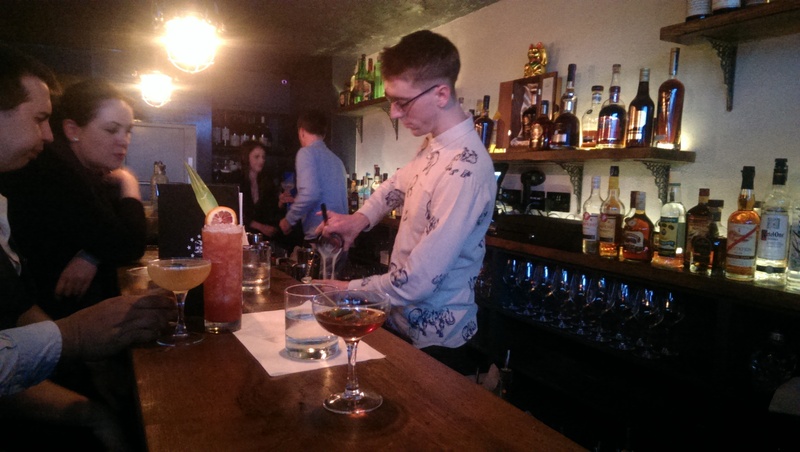 PortSide Parlour has finally dropped anchor in Shoreditch! And with a vengeance – a style redo and jazzed up cocktail list has completed the Holy Rivington Trinity of PP, NOLA and Callooh Callay. When I say style redo, we’re looking at a snazzy hardwood and copper bar, extensive display of rums, industrial lighting over green booths and further tables in the back. Rather cosy in comparison, reservations are *highly* recommended. I believe we also have some newcomers on the menu! The Lost in the Woods is a spectacular opener of an Old Fashioned with maple syrup, Cedarwood bitters, and Applewood smoke. How wonderful is this drink? The first glass I got skimped on the smoke a bit, but the second was an incredible display of the smoke’s woody aroma with the sweetness of the maple toned down by the whisky, ending on the cedarwood right at the end. Seductive, spectacular. Now, the Daiquiri Belotta is something of a marvel. Incredibly simple, and knows what it’s doing – Plantation 3 star white rum (Jamaican, Bajan and Trinidadian blend), Amontillado sherry, and Belotta liqueur. It’s far livelier than first expected, lightly citrus on the nose, yet still incredibly sweet – Belotta’s chestnut (almost chocolate) flavour goes well with the Amontillado’s nuttiness for wonderfully light sweet drink that doesn’t skimp on the liquor. There was some sampling of the food that PP wants to make essential to the new PP experience, such as the light chicken liver parfait, as a taster to the tapas menu they will be offering. The event itself was a major success, and bit of an industry celebrity collective – props to Charlie and team for keeping the Parlour afloat in its busiest hours in the cosiness of the venue; Shaun, our wonderful bartender; Connor, for the attentive service; and Cutlass Comms for having us! I see my nights at on Rivington Street getting a little bit more dizzy and confused attempting to Hailo. This entry was posted in Bars & Cocktails, Gastronomy and tagged Date, Food, Rum, Small Groups.